A Protected Geographical Indication product. Each rusk is relatively large in size, is irregular in shape and moderately hard and crisp in texture. 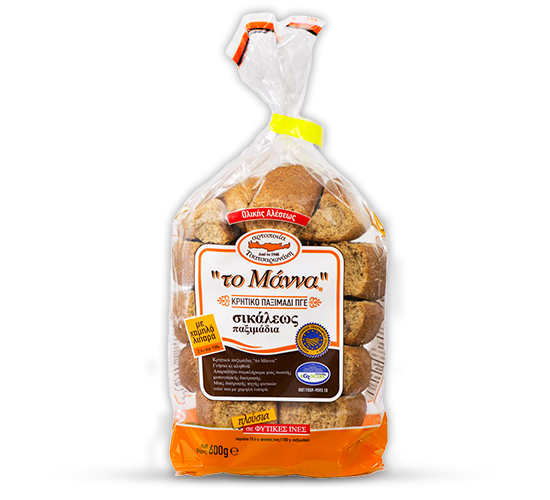 They are the most traditional rusks, since they retain all the natural characteristics that chronologically determine the first Cretan rusks. They contain whole rye flour (80%) and whole wheat flour. These raw materials make it a highly functional product with increased nutritional value. The fibre it contains has a positive effect on improved bowel function and on maintaining low blood glucose levels. These rusks are also a good source of inorganic minerals, iron, magnesium, calcium and phosphorus because they are a whole grain product.